We are convinced that it is worth reading. "Is it gonna slide seamlessly?" "Will it protect the water from evaporating?" "Will I be able to protect the water from overheating?" "Will it be secure so kids won't open it?" "Will it be custom made so it fits the pool?" "Will everything be explained to me before the installation?" "Will the installation company have credible and long history?" Thanks to years of experience at numerous building sites, the excavator was able to answer them all. It yessed 10 times, leaving the yard speechless. It had never imagined all of it's concerns solved so fast! 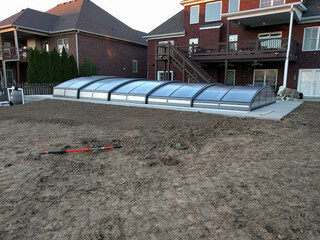 "So where can I find such a Retractable Pool Enclosure, my dear excavator friend?" was the only question the yard asked. 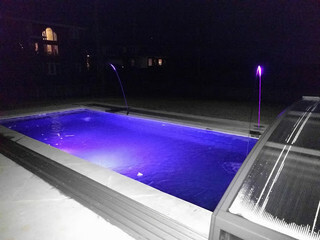 "The answer is Pool & Spa Enclosures USA - they are experts and technologically most advanced, see for yourself at www.sunrooms-enclosures.com." Well, now, this part is quite strange, isn't it? A yard going online to check a website, right? Well, believe it or not, I am telling you the truth, no matter how absurd it looks. Anyway, the yard went online to check the site and after seeing photos of hundreds of installations, all the positive references it went to Yelp, BBB, HomeAdvisor and YellowPages(just to make sure) and it was amazed. The yard found out the guy working there is called Alex and all the past customers really praised him for being helpful, explaining every detail. Together with the excavator's recommendation the yard gave Alex a call. Alex: "Hullo, this is Alex from Pool&Spa Enclosures, can I help you?" Yard: "Hi there, this is yard speaking! 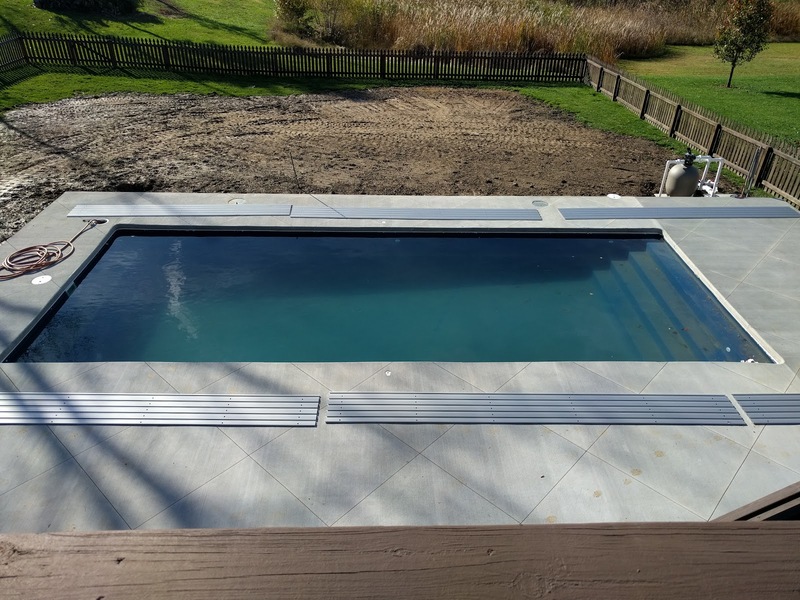 I've got 10 questions about your pool enclosures." Alex: (GULP) "OK, yard, let me answer your questions...."
As you might have guessed, all the answers were YES. 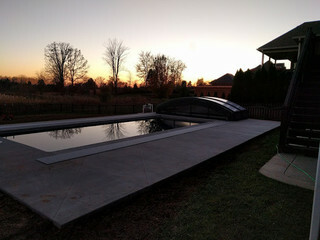 The segments move seamlessly, the pool enclosure protects water from evaporating, overheating and debris, it is secure and can be locked, it has long warranty and will withstand snow load for the area, even hailstorms, because it is custom made and the pool enclosure manufacturer has thousands of installations worldwide. Before the enclosure can be installed, the tracks need to be attached to a flat permanent surface. However, there is a built in variance in the enclosure for a slight pitch of the concrete. The tracks need to be parallel and square to ensure, easy sliding. Don’t worry, our tracks are flat, only 5/8” high, slip resistant and meant to be stepped on. 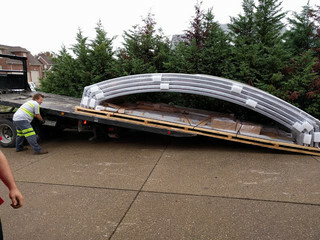 The enclosure segments are custom engineered, hand mounted and packed with foam layers so it is securely transported to the pool site. Everthing sits PERFECTLY because the pool enclosure, when it is being manufactured, is fully constructed in the factory (to ensure its quality), disassembled and shipped to the installation spot." Contact us to get your dream come true!